To turn your WordPress website into an eye-catching and interesting online asset, you need a professionally developed WordPress Theme that reflects your brand and that allows for the display of your content in the best possible way. There are literally thousands of WordPress Themes available on the internet today — some good, some bad, some free, some commercial. At inlineVision, we specialize in Custom WordPress Website Development and WordPress Plugin Development. We don’t only create your theme, but we also develop, customize and implement any additional functionality (either via specific page or post templates or a complete WordPress Plugin) your project might require. At inlineVision, experienced Software Engineers implement the required backend features, our Marketing Specialists design and optimize the desired conversion funnels, while dedicated Graphic and UI/UX Designers create the frontend visuals. We are not freelancers; everybody at inlineVision is a professional. We are full-time Developers, Designers & Marketers — with one combined goal: to create the best professional solution for you. We do not outsource – all work is performed at our office in Las Vegas, NV! – We have the primary structure, the foundation, basic utilities connections, the bearing walls, the roof. – And last, but not least — your personal interior features & design: everything from the colors you choose for your walls, the tile, the carpet, the type of doors, your bathroom sinks, your appliances, your furniture, the pictures on your wall — literally anything inside. Can you build your own house from scratch? Sure. Let’s assume you have a source where you get all the building materials you need for free (like WordPress). Now all you have to do is put it together (and put it together right). Easy enough, right? 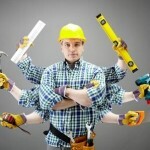 Unless you are an architect, a general contractor, a builder, a framer, an electrician, a plumber, a tilesetter, a roofer, a carpenter, a landscaper, a painter and everything else that’s required in one person and have all the tools needed to complete the job — chances are: that house will never get built. Building Contractors go through extensive training and acquire their expertise over years working in their trade; they have to be licensed, bonded and insured. Professional Software Development not only requires intricate knowledge of the inner workings of the system (or framework) that’s being used, but also a deep understanding of – among others – workflows, processes, data types, code structures and how to implement a client’s requirements and wishes efficiently and satisfyingly. Professional Graphic Design or UI (User Interface) and UX (User Experience) Design is more than manipulating a picture in Photoshop. Color theory, font knowledge, user interface optimization and many other factors combined with years of experience and training are what sets a great Graphic Designers apart from the rest. Being able to change a few lines of HTML or CSS is not Software Development and does make anyone a WordPress Developer; changing the colors on the front end does make anyone a Graphic Designer; displaying a “Submit” button is not Conversion Optimization. When your (WordPress) Web Designer tells you “That cannot be done” it’s time to talk to us!